This above quote from the United States Constitution is the beginning of one of the best known sentences in the English language. The sentence speaks of freedoms and equality amongs men. As I watched the movie LINCOLN recently and heard these words yet again, I was struck by the fact that what is stated is logically, morally and undeniably true. To think otherwise just didn’t make any sense to me. How could buying, selling and possessing human beings as slaves be an acceptable way of life for so many, for so long is beyond me. Additionally, a truth that is self-evident, I feel, is a powerful truth. But what does this have to do with horses? Over the many years I have been fortunately and closely associated with horses, I hear humans often judging the animal as bad, stubborn, naughty and deliberately disobeying their human masters. It saddens me greatly that there is so much misunderstanding of such a wonderful creature as the horse. It is judged so unfairly by humans who actually have limited experience with them, yet think they are experts. Additionally, some people who have owned horses and ridden most of their lives can do the same thing. Even certified riding instructors can inappropriately blame and label a horse as being bad and naughty (a way of hiding their own shortcomings). Horses do not think as humans do (thankfully). They react to their environment either with fear, because it is a prey animal, eaten by predators, or trust that they will be safe and survive because of the smart, experienced and wonderful leadership provided by their herd leader(s). For me, a self-evident truth is that the horse is always innocent, no matter what. I believe this is such an obvious truth that I cannot think otherwise. It is an animal and does not have the self-serving ego of a human. Its main goal is feelings of safety and that it will survive. A wild horse’s survival is dependent upon it following its leader and cooperating with that leader in all ways. When humans become the good leader for the horse, the same will happen. Most all behavioral problems with horses, other than pain related issues, stem from a lack of leadership based on trust. For horses and human, trust equals feelings of safety and trust is always earned through mutually successful experiences over time. 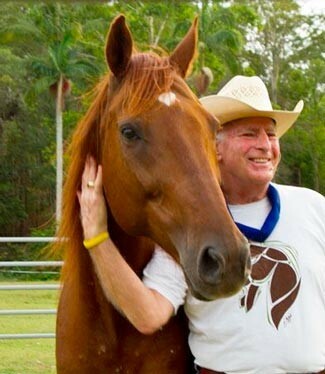 From my years with horses, I have also learned that trust and respect, with a horse, are earned and arrive together. If a horse trusts you, it will respect you and vice versa. They trust and respect their leader in the wild. They may from time to time offer a challenge to her leadership. This is simply to ask if that horse is still able and willing to be the leader. One day it will not because it is too old or infirm and another horse will need to take her place. So an occasional challenge is to be expected from a horse and not to be taken that the animal is being bad. A competent horse person should be able to recognize this bit of resistance for what it is and deal appropriately with it. It does not require punishment. The good leader will deal with it as effectively and efficiently as possible and then move on. The good leader will answer the challenge without malice, anger or resentment. Often it is only a matter of resetting a boundary that will do the job. This works for the equine or human leader of the horse herd. Setting and keeping spatial boundaries quickly earns the respect and trust of a horse. Directing all movement (each and every start, direction, speed and stop) and setting boundaries with horses are probably the easiest and quickest ways to begin to develop trust, respect and partnership with a horse. Asking a horse to maintain a 2-foot personal space boundary around the human is a wonderful exercise. Being able to direct all movement also establishes who the true leader is. Repeatedly asking for one, two or three steps-at-a-time and stop will get the horse’s attention on the human. The stop is actually the reward in this case. The best reward for any horse is total removal of pressure and a complete stop serves that purpose very well. Stop, take a few moments and breathe and then repeat the exercise. Additionally, when providing this exercise, it is important the human not allow the horse the distraction of any eating (grass or otherwise). This process, consciously and properly executed for only 5 minutes, most often will provide amazing results. It will keep the horse’s attention on the human as the leader of all movement and the reward will develop trust. Over time the complexity of the requests can increase and good effort will be continuously offered by the horse. This same process works quite well for riding horses and for horses at the beginning of training. Even experienced, well-trained horses will benefit from a one-step-at-a-time exercise offered occasionally as something different for the horse to do and think about. A rider should initially ask for something small like only a few steps in an arc and then stop (whoa) and breathe. Repeating this exercise will do the same thing for a rider as it did for the leader on the ground. Of course, a nervous or high strung horse may not be able to relax enough to take smaller steps and will resist this. In this case no restraint should be applied, but rather directed movement is the best response by the human. Lead and guide where the horse goes. Generally this will be in a circle if the horse is on a line or around an arena, paddock or round pen if the animal is at liberty. If the horse is being ridden is anxious and fearful, guided movement is always the best. As all movement is work for a horse, it will not want to move forever and the human leader needs to be able to hang in there until the nervous energy is removed via this directed movement (work). Trotting is a terrific gate and exercise for an anxious horse. A nervous, agitated horse cannot pay attention to anything. Calm and then focus must be restored before any learning can be accomplished by a horse. Additionally, acceptance that a horse is always innocent helps us to be calmer and more focused when with our horses. We will give up anger towards the horse and resentment no matter what the behavior. Probably all frustration will diminish as well. I have always found value in developing my own inner peacefulness. I have no doubts that this has assisted me to be more successful in my relationships with horses (and humans too). I discovered a long time ago that horses are attracted to a peaceful place. I always want being with me to be that peaceful place for the horses I am with. It can work miracles in our interactions and success with horses and each other. Keep in mind to give the gift of peace we have to find it within ourselves first as we cannot give what we do not have. I always suggest we seek to develop our own inner peacefulness as much as possible. I think developing our inner peace is a journey, as is life. It is not a destination but rather a path we can choose to walk. If we chose the path of peace we may find our horses happily and willingly walking by our side and with us all the way.